Week ten since Napoleon’s escape from Elba and the weather was so bad in France that it seemed that Spring would never arrive. Heavy frosts continued until the end of April and it would still be foggy in May: the Parisians must have thought Napoleon had brought perpetual winter with him. There was alarm in Brussels, with press reports that the Imperial Guard had marched as far as Beauvais and that Napoleon was about to inspect the “frontier fortresses”. Wellington met Blücher on May 3rd for the conference of Tirlemont, the day Wellington had been intending to advance into France. The two agreed to mass their forces in the centre of the long line of defence, in front of Ghent and Brussels. The Russians had still not come up to join them and the Austrians were not hurrying either. 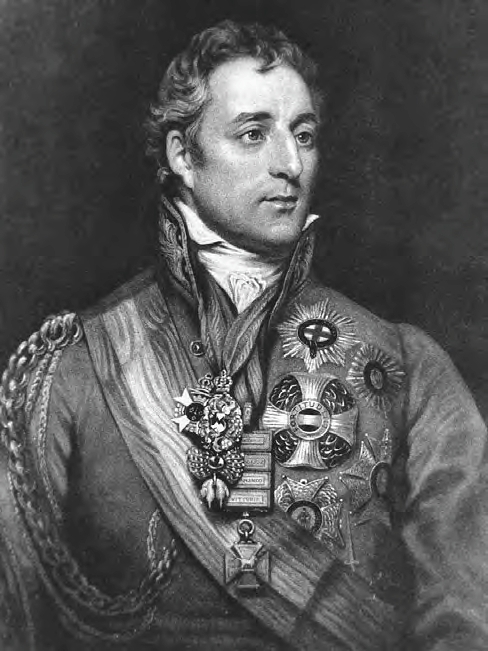 Wellington could not predict when the advance would take place and he was not happy with the state of his forces. “I have an infamous army, very weak and ill-equipped and a very inexperienced staff. 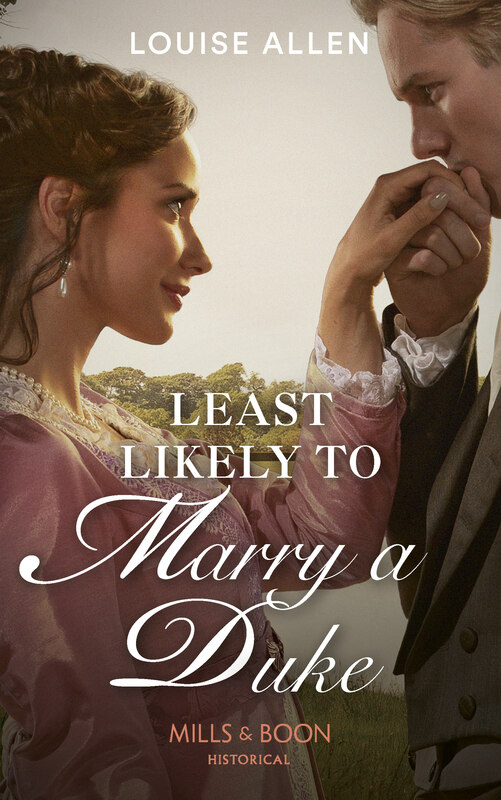 In my opinion they were doing nothing in England,” he told Charles Stewart. 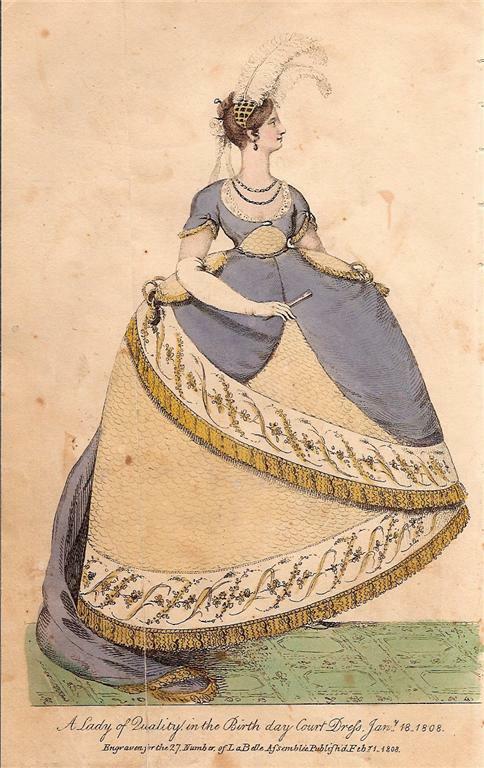 The Morning Chronicle gave the “Fashions For May”, copying the descriptions of the fashion plates in La Belle Assemblée and Ackermann’s Repository, including that for the “Angouleme Walking Dress” shown here. 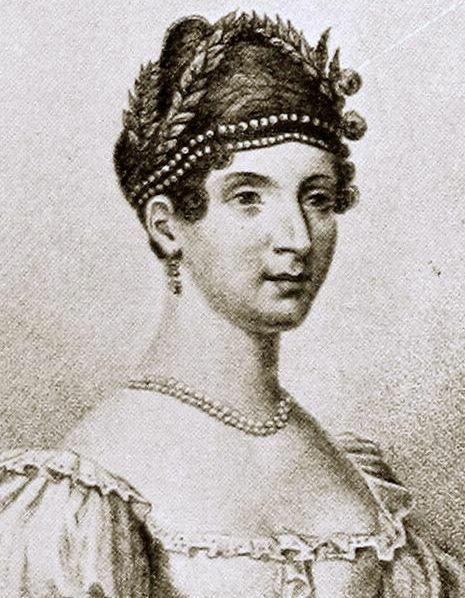 The gossip columns included the news that Earl Fitzwilliam had received a present of two black swans from New South Wales and had established them in his park and that Madame Catalini was in Brussels with her husband and proposed a series of concerts. 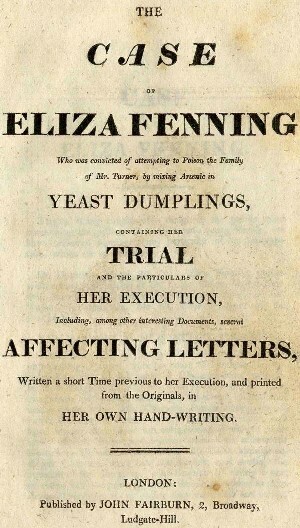 The Morning Post commented that it would not surprise their readers to learn that, “the present Ephemeral Ruler of France” would go to any lengths to establish the size of the armies massing against him and that Brussels was a hot-bed of French spies, including an apparently respectable French lady pretending to be in Brussels to see Madame Catalini perform – she was unmasked when one of her servants was recognised and surprised destroying compromising documents. 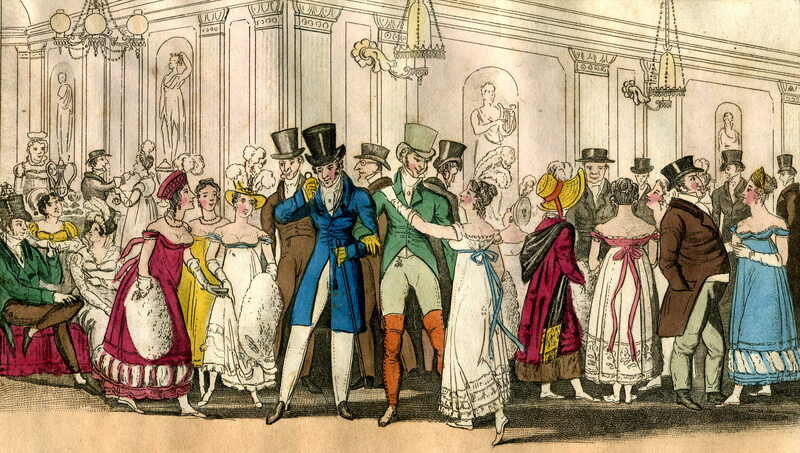 Mrs Camac held a fashionable masquerade in Portman Square. “The entrance hall and staircase was tastefully ornamented with rural arches, alcoves & hedges formed of laurel and orange branches studded with real fruit and brilliantly illuminated by variegated lamps, A full band of Pandeans enlivened the scene.” Some of the costumes worn were given: “Mr Impey, first as a bride & then as a bridegroom; Mr Barnett, a witty French hair-dresser, Mr C. Caldwell, a busy soldier’s wife,… Mr Holmes, an Irish footman…” No characters were reported for the lady guests. 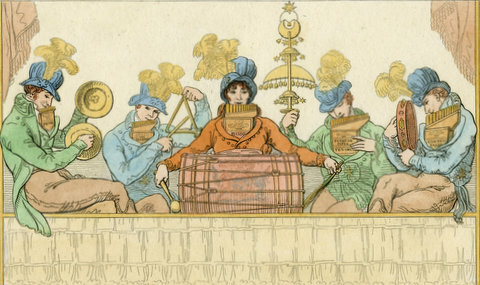 Pandean bands were popular entertainers on pan pipes, as can be seen in this print. 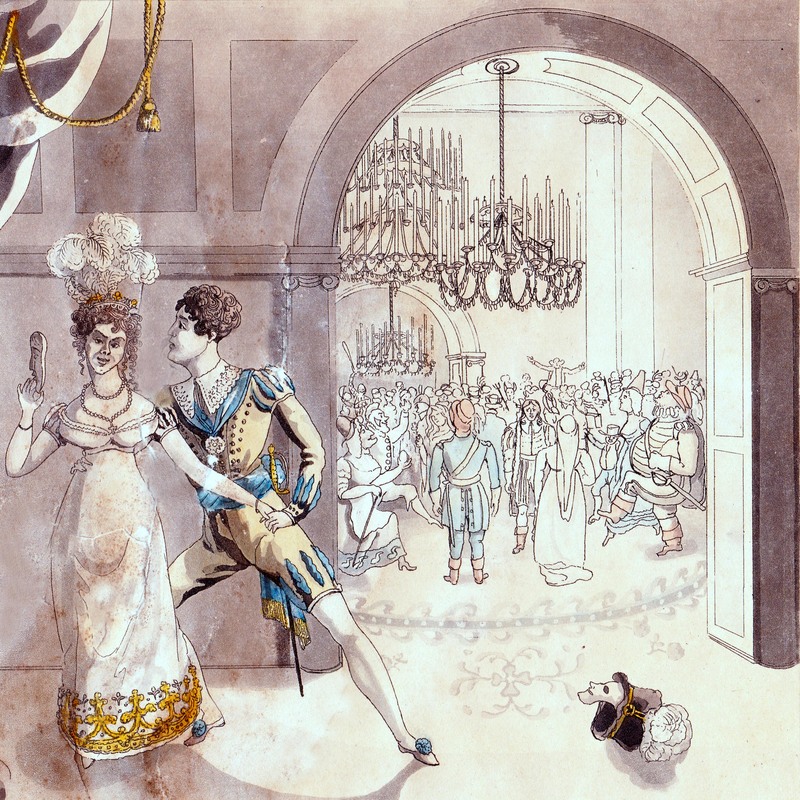 The print above, showing a detail from a masquerade scene depicts a lady holding a mask made of painted metal gauze and through the arch a number of costumes including Mother Goose, a clown and various historical outfits. The French menace just across the Channel did nothing to reduce the popularity of the South Coast resorts and it seems that the presence of troops gathering on the south coast, with the consequent increase in the number of officers looking for entertainment in the seaside resorts, only added to the attraction. It was still rather early for the main season, but there was speculation in the press that the Queen, accompanied by her daughters, might be planning to spend a short time in Brighton for the sake of her health. 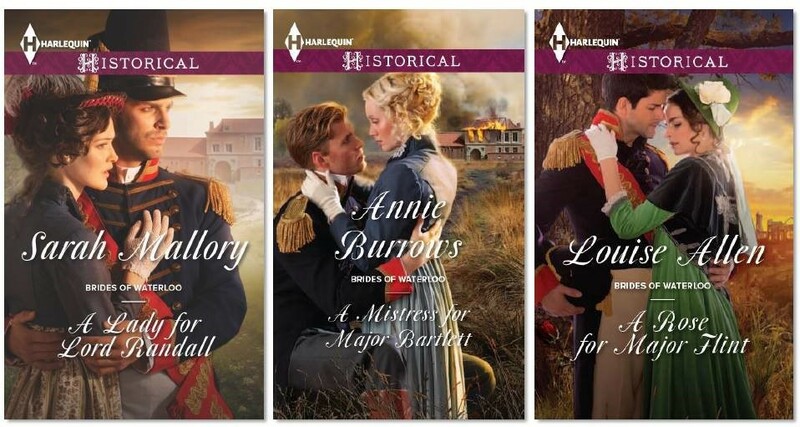 The Road to Waterloo – Week Eight. The Tricolour Floats Throughout the Empire – and Is Lady Roseberry To Be Turned Naked Into the Streets? At home there were reports in the papers of the inquests on seven American prisoners of war shot attempting to escape from Dartmoor prisoner of war camp, a bleak institution high on the moors. 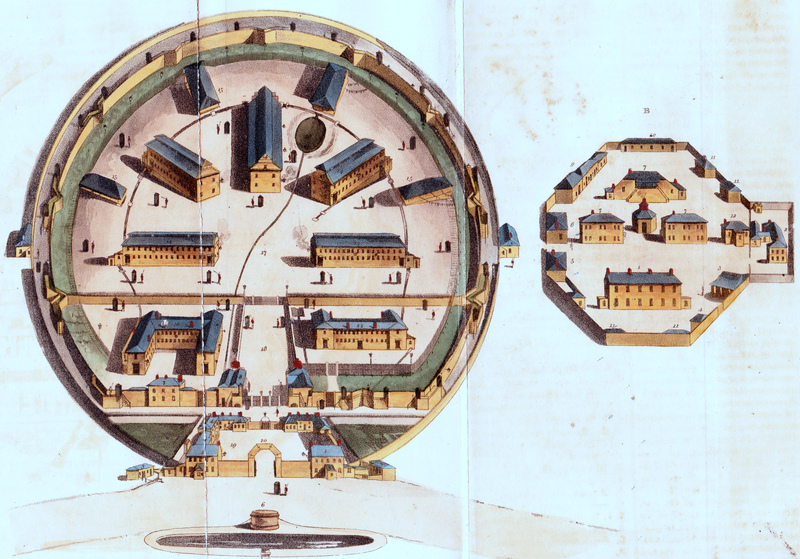 The print above is from Ackermann’s Repository in 1810 when the prison was newly built. The smaller enclosure to the right is the barracks for the troops guarding the prisoners. In the House of Commons Mr. Bathurst proposed an Aliens Act to protect against subversive French aliens. It was rejected as unnecessary – apparently the House shared the Morning Post’s opinion of the loyalty of British citizens. 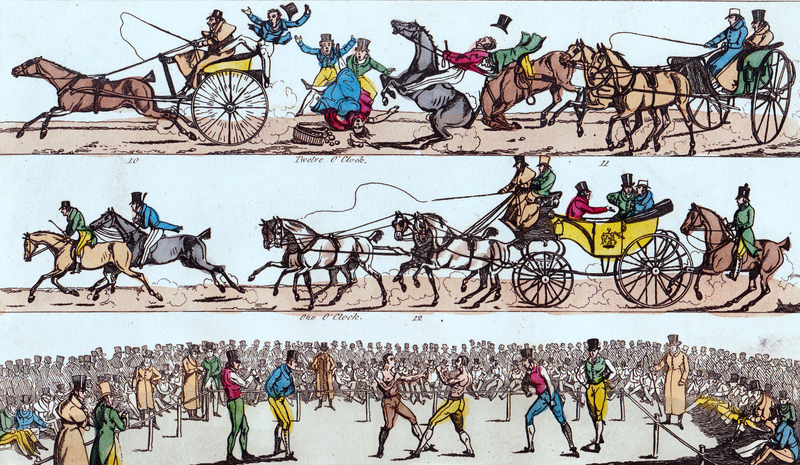 The print Road to A Fight by Henry Alken (1821) shows the sporting gentlemen all rushing to the ringside. 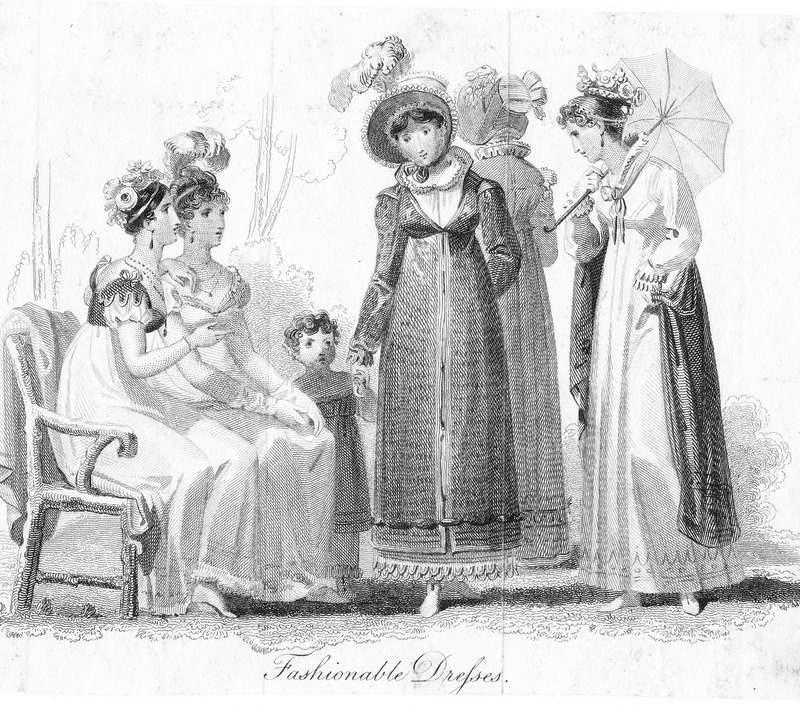 “Elegant, Nouvelle and Fashionable Millinery, Dresses, Pellisses, Mantles etc etc – Thomas and Co. agreeable to their usual plan, have (under the superintendence of Mrs. Thomas) completed the greatest choice of articles in the above branches, uniting in a pleasing style, the French with the English taste, and which are composed of prime and nouvelle materials. The above are particularly adapted for evening or full dress, the dinner party or the promenade and from being made in all sizes enables them to execute any commissions with all possible speed and thereby doing away (in a very material degree) the necessity of giving orders. 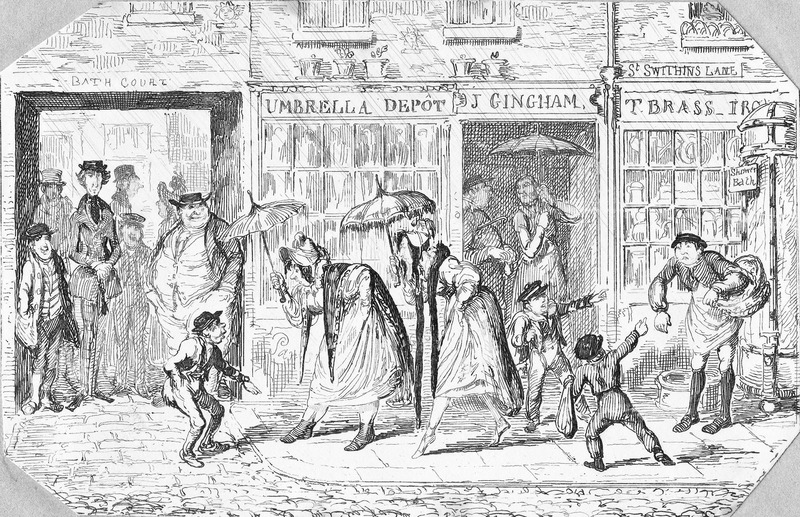 193 Fleet- street, west end corner of Chancery-lane.” The charming little image above is from a lady’s memorandum book for 1815. The foreign papers, reported on Monday, told that the Belgians were undergoing “the most lively sensations” – as well they might. British ships had been permitted to enter Dieppe peaceably and that appeared to be the official port for communications, Meanwhile, in Paris, Napoleon seemed largely concerned with returning affairs as quickly as possible to the position before he left, including changing back the names of Paris streets. “The Duc d’Orleans and his daughter, with their suite, arrived from Amsterdam and put up at Greillon’s (sic) Hotel, Albemarle Street.” It was not clear whether they intended staying for the duration of the emergency, or whether this was just a visit. “Madame Catalini’s delightful retreat, The Hermitage, at Old Brompton is to be disposed of. 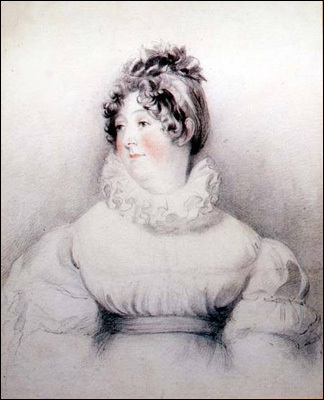 In the event of her return from France, her engagements are so numerous and particularly during the summer months, when the Hermitage may really be compared to a paradise, that she has no means of enjoying th e advantages that its easy access to town will afford some more fortunate purchaser. The interior embellishments and furniture are spoken of in high terms of admiration. Mssrs. Robins are empowered to dispose of it, and report says, at a sacrifice to the fair warbler of many thousand pounds.” Madame Catalini (shown left) was a singer of huge international fame who would appear in Brussels to great acclaim as the crisis developed. 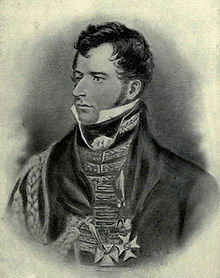 Wellington arrived in Brussels on Tuesday to take command of an Allied army that would total between 800,000-1,200,000 men when mustered and on Saturday 8th April Bonaparte ordered the general mobilisation of France. The situation was escalating. The Marriages column of the Morning Post on Monday recorded one of the marriages of military men now gathering in Belgium.